The Task Recorder tool in AX 2012 and D365FO is a great resource to create documentation around business processes and tasks. I’ve written in the past that one of the other side effects of this feature is that it also records the objects being used during the process and therefore can be used to help set up security. When launched the application will ask for an input XML file, based on the file provided it will determine whether the file is from an AX 2012 or D365FO task recording and then obtain the menu items used during the process. 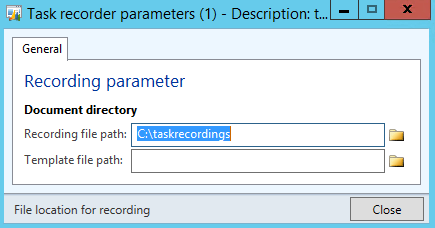 In AX 2012, when you perform a task recording the recording XML is automatically saved when you end the recording at the location you specify in the parameter window. 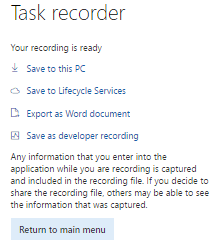 In D365FO, when you perform a task recording at the end you are prompted on how you would like to save it, chose the ‘Save as developer recording’ option which will download the recording as an XML. 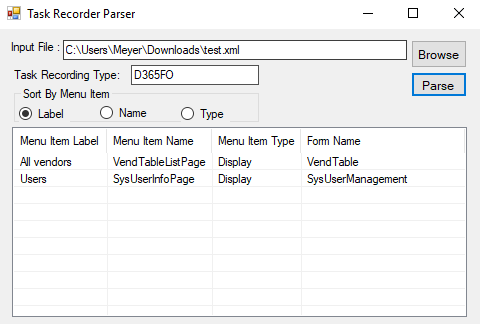 These are the task recording XML files the Task Recorder Parser expects as input. I tested this against an AX 2012 R2 CU7 and R3 CU8 environment as well as a D365FO 8.0 PU20 environment. In my work at Fastpath, we actually take this one step further and actually look at the access type needed to during each step of the process. This is how we are able to create tools like the Security Designer tool for D365FO and the Task Recorder analysis features. For a full listing of really cool features we have been working on around this topic feel free to check them out here. (This feature has been added as of 10-25-2018) I want to add the ability to export the output of grid to CSV and Excel formats. As always, feel free to leave feedback and suggestions on new features and reach out if you have any questions or issues.